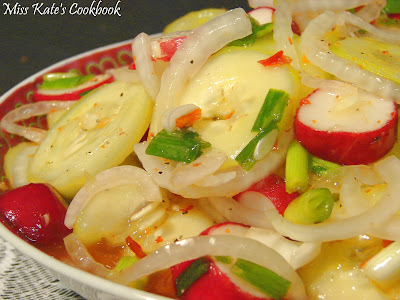 I love cucumbers and radishes, so I combined and came up with a new twist on cucumber salad. The radishes bring in the crunchiness and zest, while the sweet chile sauce spices it up. This is a fast and easy recipe to prepare and it is delectable! I believe you will love this salad as much as I do and will be making more than once this summer. Toss together cucumbers, radishes, green onions and onions in a large bowl. Combine the vinegar, salt, pepper and sweet Chile sauce in a small bowl and pour over cucumber mix. Stir, cover, and refrigerate until cold. At least one hour.